New Media Guru provide different types of engagement model to suit your budget and project specifications. 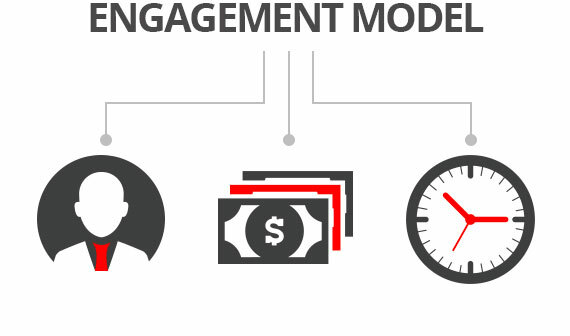 Every project is unique and our team will work closely with you from defining your engagement model all the way to the final project delivery. Clients who are just starting out on projects often want to engage our services as consultants. We might provide a proof of concept, a feasibility analysis or help develop a requirements document. Because of budget limitations in the feasibility stages of a project many clients wish to use an engagement model to define the services we provide until the project is confirmed. For other clients a longer term engagement model is ideal – we can collaborate with your team on a long-term basis to help with planning, risk management and more. This allows clients to start receiving deliverables quickly and to continue as and when budget allows. If you have a long-term project we can dedicate an entire team to working with you and for you. If your budget is constrained a fixed price engagement model ensures that you don’t go over budget. This engagement model is perfect for projects where the specification and scope is still unclear and requires flexibility. These complex projects often undergo design changes part-way through the process and paying as you go for time and materials allows clients to access our services as and when they need it rather than signing up for work they then might not need due to changing specifications. If you would like to work with us for the long-term you can pre-book the resources and hours you will need in a yearly or half-yearly contract. We will reserve time for our personnel and resources to dedicate to your project and you’ll be able to use these resources as and when you need them. Here the project is closely defined and both parties agree on a fixed price. This is perfect for a well-defined project with a limited budget because you know exactly what you’re going to receive.